The S&P 500 has rallied almost 17% in the past seven weeks, but it is still down about 6% from its all-time high of almost 5 months ago. Corporate profits continue to rise—trailing 12-month earnings are up almost 22% in the past year—yet PE ratios (how much the market is willing to pay for a dollar's worth of earnings) have dropped by over 20% in the past year. Key Treasury yields have dropped precipitously since their early November '18 highs: 10-yr yields have fallen 55 basis points, and 5-yr real TIPS yields are down 40 bps. (Treasury yields tend to be good barometers of the market's optimism about future growth prospects, and their decline reflects a meaningful loss of confidence in the outlook for future growth.) 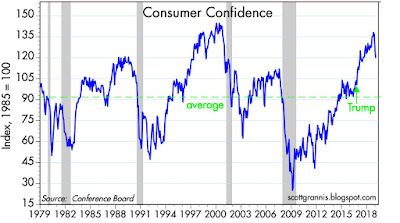 Measures of confidence also have dropped quite a bit in the past month or so. Yet despite all this, stock prices have rallied, and job openings are at record highs. How can we reconcile all these disparate moves? It's a mixed bag, to be sure, but my reading of the market tea leaves points to investors that are still acting more out of caution than of greed or optimism. The stock market is up, but it's not euphoria that's driving things, it's simply the market becoming less worried about the future. Still worried enough, however, to limit forward progress. 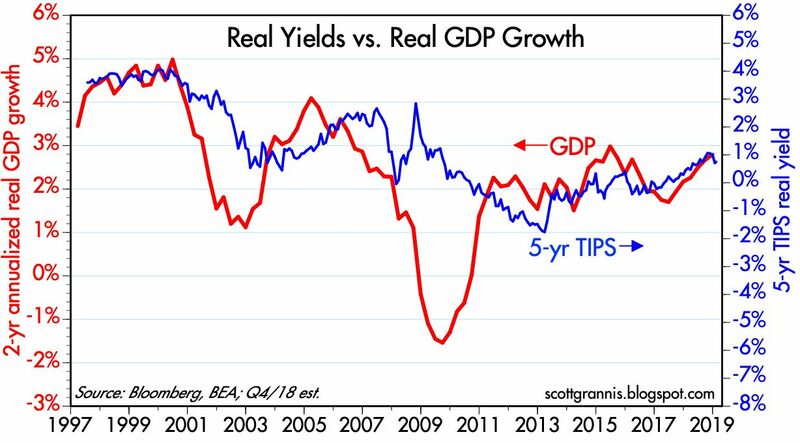 Chart #1 compares the real yield on 5-yr TIPS to the 2-yr annualized rate of growth of real GDP. 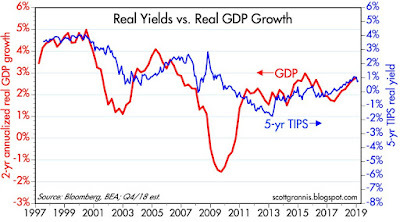 The two tend to move together, which suggests that real yields on TIPS are a good proxy for the market's expectation of the current trend in economic growth. Economic growth has been picking up for the past two years, and real yields have moved up in sync. But the recent drop in real yields suggests the market is now pricing in the expectation that real growth is unlikely to exceed 2.5% or so over the next year or two. This further suggests that the market believes that the beneficial effect of Trump's tax and regulatory cuts has been mostly exhausted. Conclusion: the bond market is not very optimistic about future growth prospects. Hopes were higher a few months ago, now they're more tame. 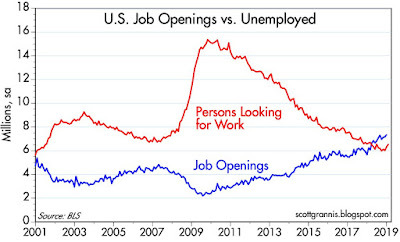 Chart #2 compares job openings—which have jumped in the past year to record highs—to the number of people actively looking for a job. This sounds like jobs nirvana: more jobs on offer than there are people looking to work! 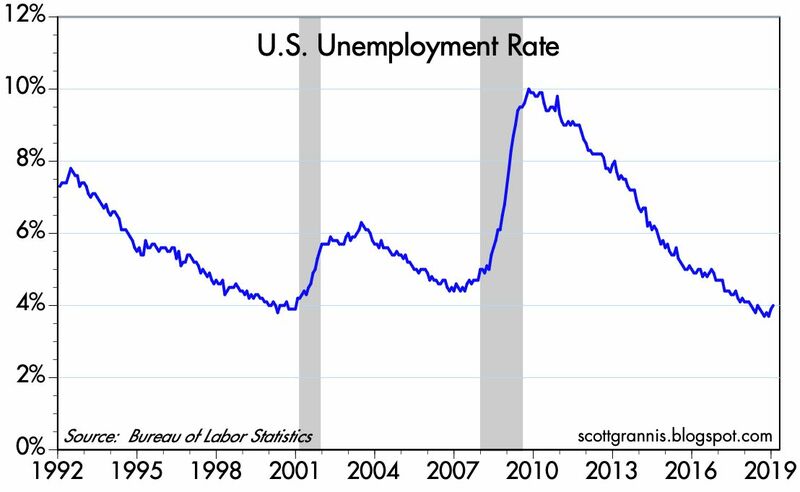 But as Chart #3 shows, the unemployment rate has ticked up in the past two months, from a low of 3.7% to now 4.0%. That sounds bad on the surface, but there is a positive explanation for this: with more jobs and higher salaries being offered, more people have decided to enter the jobs market who were previously sidelined. 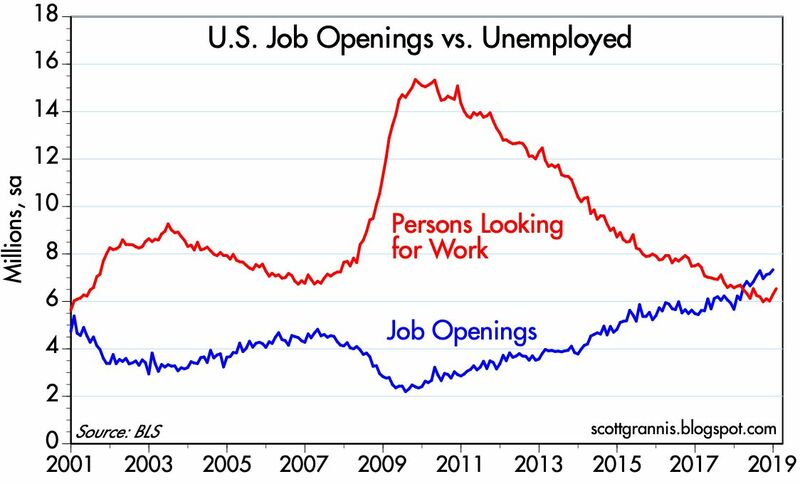 The workforce (those working or looking for work) is expanding faster than jobs are being created. This is fabulous. 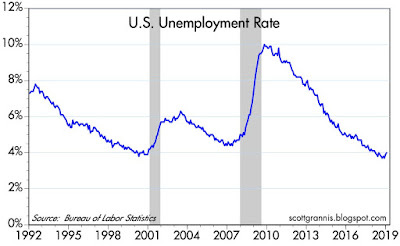 In the past, an uptick in the unemployment rate meant the economy was beginning to slow down. Now the uptick means the the economy has more upside potential than it did before. Mixed signals, but the unifying explanation is that the economy is still OK, still healthy, and primed for more growth if and when worries subside further. Chart #4 shows the recent sharp drop in consumer confidence. It's still relatively high by historical standards, but a drop like this after a long run-up is reminiscent of what happens just before recessions. I hate to say that "this time is different," but the recent drop in confidence seems to have been motivated by "global angst" more than by any actual deterioration in the economy's fundamentals. I expect to see confidence turn up with the February survey, and I think the stock market rebound in the past month or so makes that a reasonably safe bet. The stock market is much quicker to respond to changing conditions than monthly surveys of confidence. 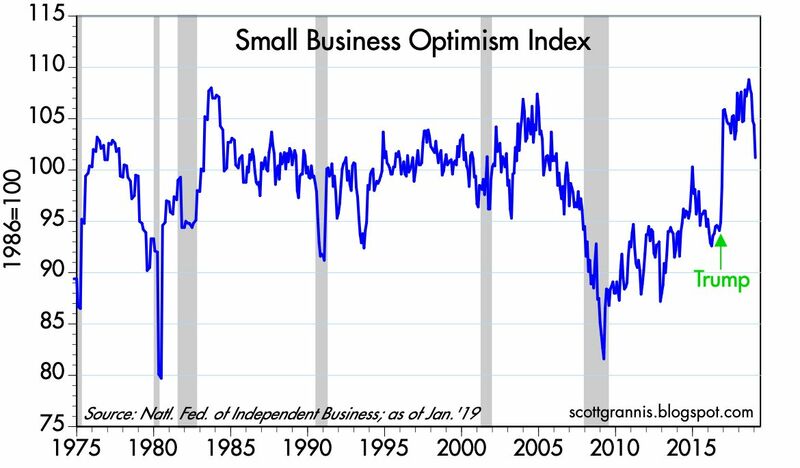 Chart #5 shows the sharp drop in small business optimism that has occurred since last August's peak. The best explanation for this is that higher tariffs on Chinese imports—which Trump thinks put pressure only on the Chinese—are making life difficult for a number of US industries. Higher tariffs on steel make steel more expensive, and that in turn makes a lot of things that use steel more expensive, for example. People are justifiably worried that Trump's tariff war with China could be getting out of hand. At the same time, the December plunge in the stock market added to concerns that conditions were deteriorating. For now the decline in confidence and optimism are most likely lagging indicators rather than leading indicators of worse things to come. 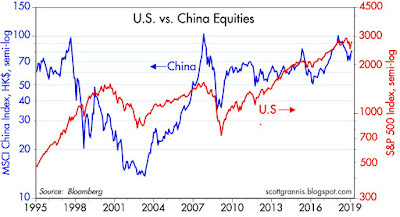 Chart #6 compares the performance of Chinese and US equities. Note that both y-axes are scaled equally (the top value is 15 times the bottom value) and the chart is plotted on a semi-log scale. Chinese equities have not only been much more volatile than US equities, their total gains over the past quarter century have much weaker. Who says China is beating us? In any event, both the US and Chinese equity markets have turned higher in recent months, which suggests the market is sniffing out an end to the tariff wars. That makes sense to me, since reducing or eliminating tariffs is good for all concerned. Why would the Chinese want to resist a deal that would be positive for their economy? 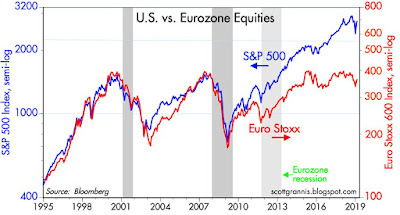 Chart #7 makes a similar comparison between US and Eurozone equity markets. 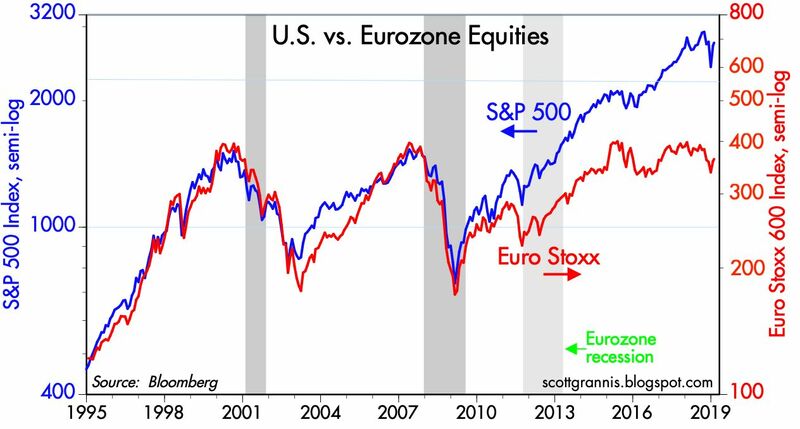 US stocks have outperformed their Eurozone counterparts by a staggering 75% since the lows of March 2009. 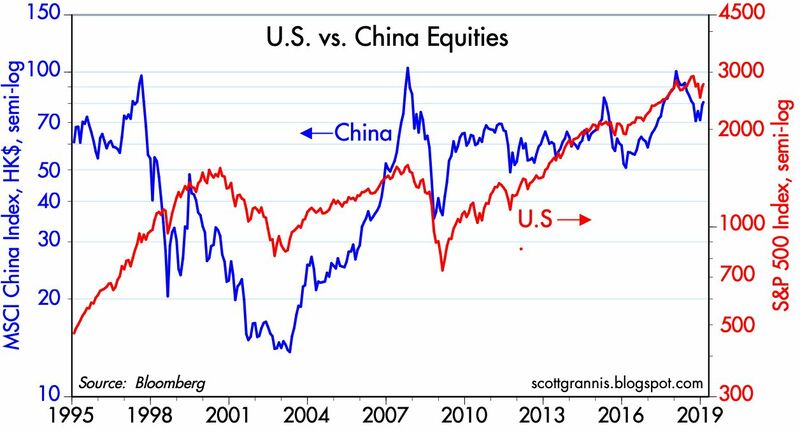 In fact, US stocks have outperformed Chinese stocks by almost the same amount over the same period. The US economy is on a roll, and global capital wants a piece of the action. 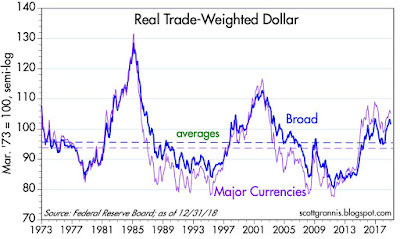 The strength of the dollar, shown in Chart #8, is broad-based, but not excessive—as it was in the mid-1980s and the early 2000s. Those periods were characterized by aggressive Fed tightening, which is not occurring today. 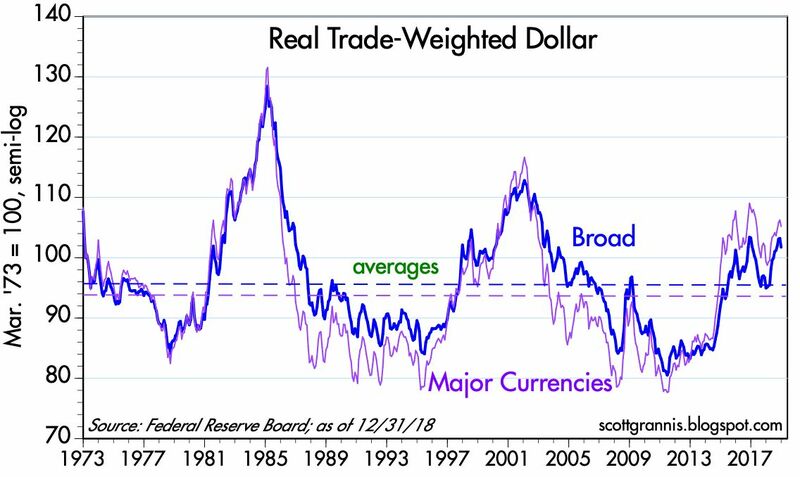 Today the dollar's strength arguably owes more to the relative attractiveness of the US economy than to any actions on the part of the Fed. Chart #9 compares the value of the dollar (inverted) to an index of industrial metals prices. 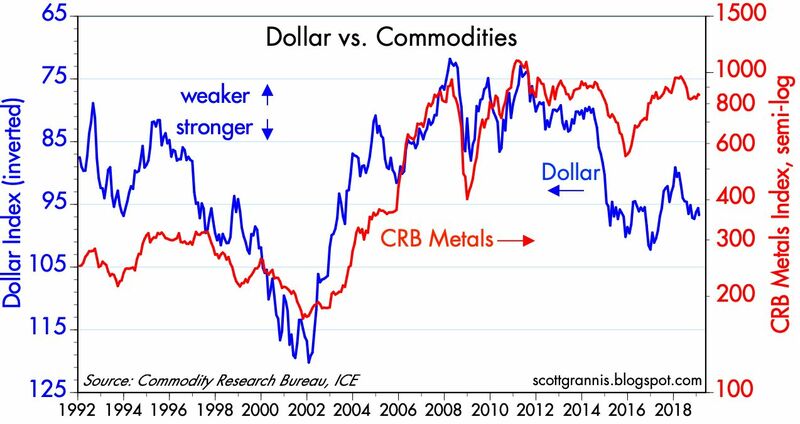 When the Fed was very tight and the dollar was very strong in the early 2000s, commodity prices were extremely weak. Today it's different. The dollar has risen significantly in the past 5 years, but commodity prices are still relatively strong. Conclusion: US monetary policy is not adversely affecting the global economy, and that's good. Emerging market economies (the ones most dependent on commodity prices) are not being strangled by an overly-strong dollar. In fact, the Brazilian stock market in dollar terms is up 180% in the past 3 years! The laggard economies are to be found in Europe and Asia, where government intervention has smothered private sector initiative. 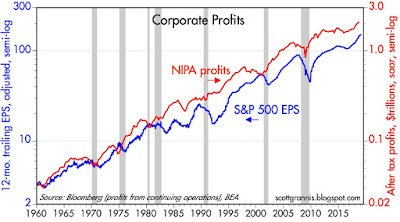 Chart #10 shows the two main measures of corporate profits. NIPA profits are based on corporations' filings with the IRS and are annualized and adjusted for inventory valuation and capital consumption allowances. S&P profits are trailing 12-month earnings per share, reported according to GAAP standards. Both show that profits have risen at an impressive rate in the past year or so. Much of that is due, no doubt, to the reduction in corporate income tax rates, but it is still impressive. 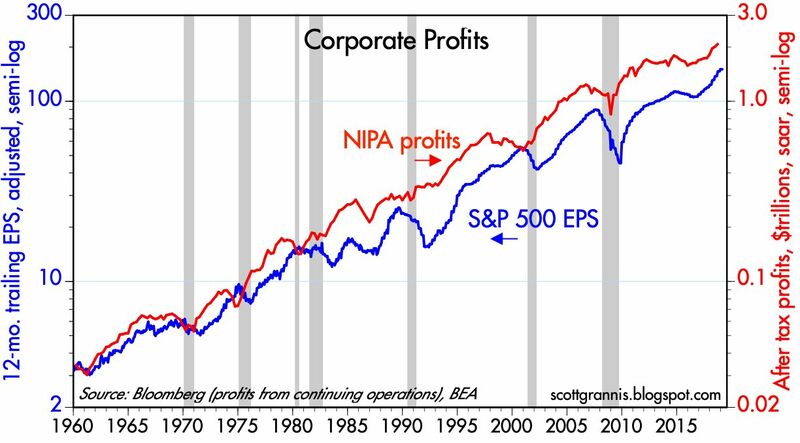 But consider this: since the end of 1999, just before the blowout peak in stock prices, GAAP reported profits have tripled, and NIPA profits are surged by almost 250%. Yet the S&P 500 index is up only 87%. 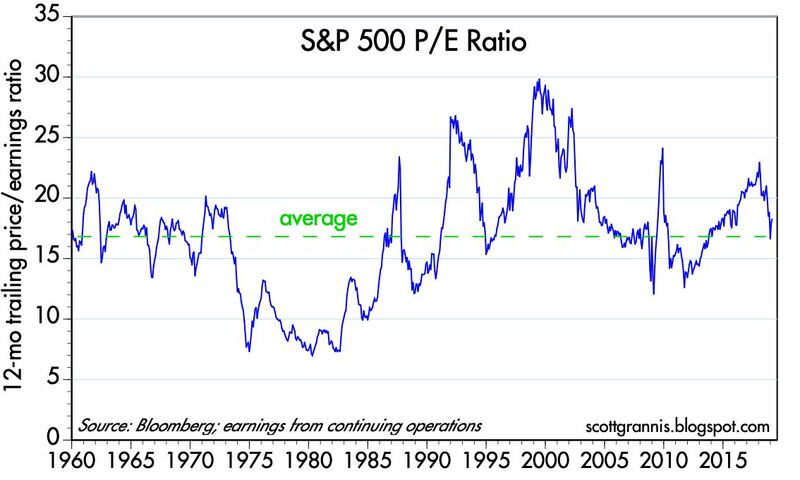 It's hard to use this data to make a case for equities being overpriced. 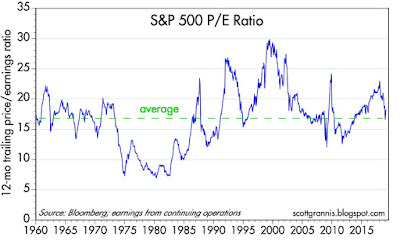 Chart #11 shows the history of PE ratios for the S&P 500. They peaked in 2000 at around 30, and now stand at just over 18, a mere 8% above their average since 1960. Again, it's hard to use these facts to argue that stocks are over-priced. Profits have surged, yet the price of a dollar's worth of profits has plunged. This market is cautious about the outlook for the future. 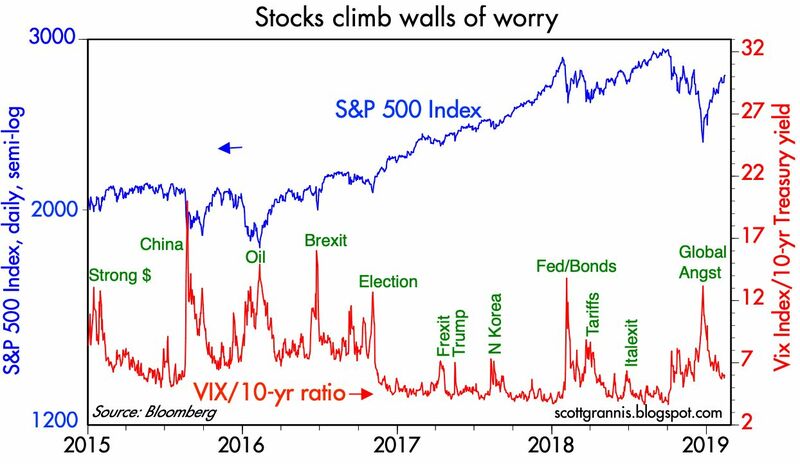 Finally, Chart #12, my favorite "wall of worry" chart. The market appears to have gotten over the bulk of its recent worries, but worries still linger in the form of a higher-than-normal Vix and relatively depressed Treasury yields. I'd characterize the market and the economy as in a holding pattern: fundamentally healthy but still worried about the future. Animal spirits are on a tight leash until it becomes clear than global disturbances are being correctly dealt with. All eyes are on Trump and Xi and their upcoming meeting. Re: All eyes are on Trump and Xi and their upcoming meeting. I think all eyes are on retail sales and a very bad holiday season,where retails stuffed their channels and then had massive amounts of unsold inventory -- the other shoe, hasn't dropped yet, but look for earnings revisions to be ugly! This seems to be a good time to be looking at current facts versus backwards towards the good years. The area where China is beating is in the rollout of 5G technology. US telecoms will likely not be able to make up the shortfall on their own. Re China and 5G. My understanding of 5G is that it will be at least a year or so until phones are available that can utilize 5G efficiently. 5G requires new antennas and new, integrate CPUs and modems that aren't yet available and/or efficient. I question also whether 5G will make a noticeable difference to the average user, at least in the early years. My iPhone XS already handles wireless data with speeds of 20-50 Mbs, and pages seem to load almost instantly. I think the real benefit of 5G will take years to realize, since it will require a huge buildout of small base stations and a huge increase in the number and types of devices that connect to it (e.g., cars). Re the huge and unexpected decline in December retail sales. This was so out of the blue that it strains credulity and runs counter to all anecdotal commentary. It's also quite likely that the government shutdown played a role. It's hard to take a big aberration like that seriously in any event. Besides, retail sales are not what drives the economy in the first place. Supply-side logic teaches us that consumer demand is a function of jobs, hours worked, business investment, innovation, and productivity. Supply is what makes the world go 'round, not demand. Another terrific review of the economy by Scott Grannis. My own take is that Sino US trade relations are much overblown as a public issue. The math is rather minuscule when you look at it. A small amount of trade may have tariffs on it going forward, and China may open up some markets a little bit. Beyond that, I am not sure that exposing the US economy to the Sino economy is really that smart of a plan. President Xi and the Communist Party of China are running an increasingly repressive and suppressive and oppressive state. That is an investable situation? US multinationals have invested heavily in the communist-provided manufacturing platform. Gigantic investors have also taken stakes in China, such as BlackRock. Multinationals more or less control US foreign, trade, and military policy. This is in fact a dicey situation. US elites have been placed into the position of appeasing or pandering to Beijing, a nation of gathering darkness. President Trump may be more right than the elites are willing to acknowledge. 1. Tariffs going to 0% would be great temporary news for stocks and time to get out if the global economy is something you worry about because China is running on credit steams. They might go into another debt-driven stimulus but the end of their debt capacity isn't that far away. 2. Europe is in a mess. Breaking apart. The underlying issues connecting all of these are resulting in populism's rise in Europe and the economic left in the U.S. It doesn't seem like those responsible are willing to recognize these issues. At the same time, I would not bet against America, things are looking good. Great stuff and Roy makes an excellent point re Europe and the dems embracing absolutely proven failed policy. The left pols are delusional but the left voters are more so. Egads! As a long time bond trader I think your analysis is spot on, Scott. Treasury bonds are actually trading slightly higher in price now than on 12/26 of '18 DESPITE stocks rallying 17%. That is extremely unusual. Flight to quality AND to stocks? It just doesn't happen! Status quo or outright confusion by investors? Hedge funds had their biggest month in ten years in January and as a trader it was like shooting fish in a barrel. (of course, if this kind of market is what it takes for hedge funds to prosper, investors are in trouble). I'm fully invested as of now but a week from now? I would hate to attempt to prognosticate the next 10% in either stocks or bonds at this point. DEM takeover of the House has sucked the life out of the animal spirits. After the fastest GDP and Wage growth in a decade, with RECORD LOW unemployment rates for our most marginalized citizens....Americans still voted to hand over the House of Representatives to Socialist control. Let that sink in. Mix in an incompetent Fed, undercutting the President's negotiating hand with China. Incompetent Fed or part of the Swamp? Its all part of the coup against the most pro-America President since Reagan. OF COURSE, the markets crashed, and consumer retail spending got put on hold. We just lived thru years of Socialist rhetoric, and now the country wants it back, despite the recent prosperity??? This is not a great environment for animal spirits. If America loves AOC instead of Trump, we are in major trouble. Socialism starts at home. Too many parents giving their adult children everything they want even if the kids don't have jobs or jobs that pay for the standard of living they want. No wonder they vote for socialists. @fred: Agreed. An extension is parents that let their kids get away with blaming the coach, teacher, the "system", etc for everything that doesn't go their way. I see it in some of our best friends. There is no accountability, and no understanding that the world is not "fair" and we shouldn't expect it to be. Better parents teach kids not to blame others, and to learn to roll with the punches and show some resilience. This is one of democrats biggest failures. The traditional role of democrats as defenders of the little guys, the workers, has evolved into full blown victim Olympics. It's a moral tragedy. Those they are supposed to be helping are hurt more in the long run. Re: Out of the blue seasonally adjusted retail sales fell by 1.24% from November. Seasonal adjustments help tell the story in the long-run, thus we'll see if this "glitch" will in fact be a case of inventory shipment buildups and unsold merchandise (channel stuffing) versus actual sales. The decline is massive! The reason behind hesitation in the market, is weak GDP growth and that's reflected in bond yields. It seems like there are structural GDP problems at work, which are not being solved by exciting headline employment values or traditional supply/demand observations. 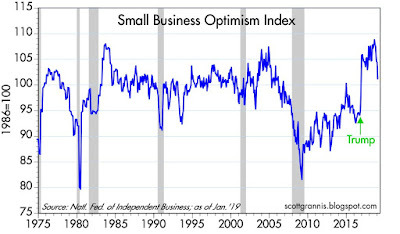 The decline in retail sales, along with declines in oil prices seem almost directly related to capacity utilization problems, where there is weak demand - which seems to connect to low wage growth, low savings rates and this nagging hesitation issue, where the future seems weaker. 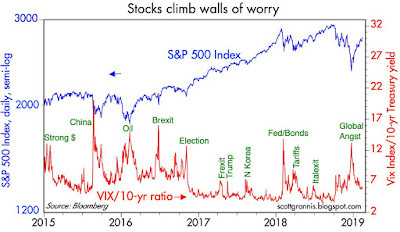 I love The Wall of Worry chart, but in a way, it shows that investors are often willing to overlook GDP decay and instead focus on the upside of speculation while ignoring risk management. Fred makes a damn good point that I had never thought of-and a scary one at that. IF he's right-and I have no reason to believe he's not AND given that US is def becoming more leftist as us baby boomers (and older) age, we're in deep *&^%. I've long thought that the US was becoming more left inevitably which is why I was surprised to see DT win in '16 but that may have been the last hurrah for anything remotely resembling conservatism. That America can embrace a completely clueless pol in AOC is pitiful. Anecdotal evidence of this is that NYC basically reneges on their deal with AMZN and they think they're better off! What will existing and future businesses think about setting up shop in NY? Better off somewhere they're wanted.
" retail sales are not what drives the economy in the first place". Retail sales do drive the economy. Without retail sales there is no economy ! Cliff: think about it. We can only demand an amount equal to what we produce. Production/supply comes first, then comes demand. This is the secret to supply side economics. "We can only demand an amount equal to what we produce"
I do not understand this sentence. Surely demand at a certain price can exist for something which cannot be supplied at a certain price. Another question: let's say there is country B whose economy is quite large; this country has for many years subsidized (by taking money from its own households) various products and sold these products to the US at prices far below what US companies can produce. At the same time, this causes a reduction in demand by its households. What would the impact of that be on the supply and demand model when applied to the US (would it consider country B)? And would this be considered when calculating expected inflation? Thanks. Re: Production/supply comes first, then comes demand. Obviously this is a matter of capacity utilization and productivity, i.e., too much supply and weak demand. You see this in oil, autos and retail. If Costco wanted to fill an entire warehouse with yellow bow ties, there is the potential capacity to do so -- but are there enough people demanding that product ... hell no! Fast-forward to the general concept that demand within the economy has been weak all through this synthetic recovery -- and GDP isn't being boosted by having too much production. Amen. an amount equal to what we produce. Production/supply comes first, then comes demand. This is the secret to supply side economics." That is a meaningless circular "chicken and egg" argument. supported by the expansion of credit. products that consumers will buy.